Chance takes center stage at this year’s Halloween Horror Nights! This fall, the streets of Universal Studios Florida™ come alive with hordes of horrifying mutants, monsters and maniacs. Explore nine all-new terrifying haunted houses, brave multiple creature-filled scare zones, enjoy outrageous live shows and experience many of the park’s most exciting rides and attractions. This year Universal gets iits first upcharge house at Halloween Horror Nights. With a team of investigators, enter a centuries old, secret warehouse where mysterious artifacts have been collected and stored for hundreds of years. Advanced supernatural and paranormal devices are being tested using state-of-the-art technologies to determine the power these relics hold. You make your way through multiple rooms and find yourselves transported to various worlds in this personalized, mind-bending experience. THE REPOSITORY takes you into a terrifying, first-of-its-kind realm of psychological horror – an experimental journey that’s a disturbing combination of fear and Virtual Reality. Available on select nights from September 29 through October 31, you’ll explore truly unnerving environments, encounter bizarre objects and interact with unforgettably haunting live actors. Reservation times are available between 5:00pm and 1:00am. This exclusive horror experience is open to guests ages 13 years and older with a Halloween Horror Nights™ event ticket. 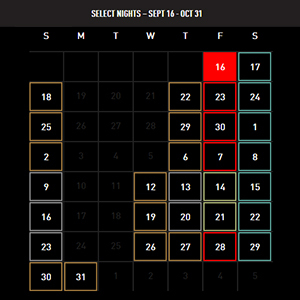 Halloween Horror Nights™ ticket and reservations are required and must be valid for the same day. Only four (4) guests per group. Guest(s) may be paired with another group or groups may be separated. The streets of Universal Studios Florida™ theme park come alive with hordes of horrifying mutants, monsters and maniacs. Make your way through 5 nightmarish scare zones where gory and grotesque creatures lurk around every turn. Don’t let your guard down or it just might be the last thing you ever do.